It is amazing to know that God chooses and uses weak, ordinary men and women to accomplish his purposes for his kingdom. It\’s not about great men and women of God but a Great God! He is never failing. The life of a missionary is not glamorous, it\’s full of hardship. I think that when it comes to serving Jesus it requires a lot of sacrifice. Some of these sacrifices are very easy. Some are much more difficult. Sometimes God will ask you to sacrifice your family and friends and that is a little bit more difficult. The term sacrifice seems so harsh and strong. 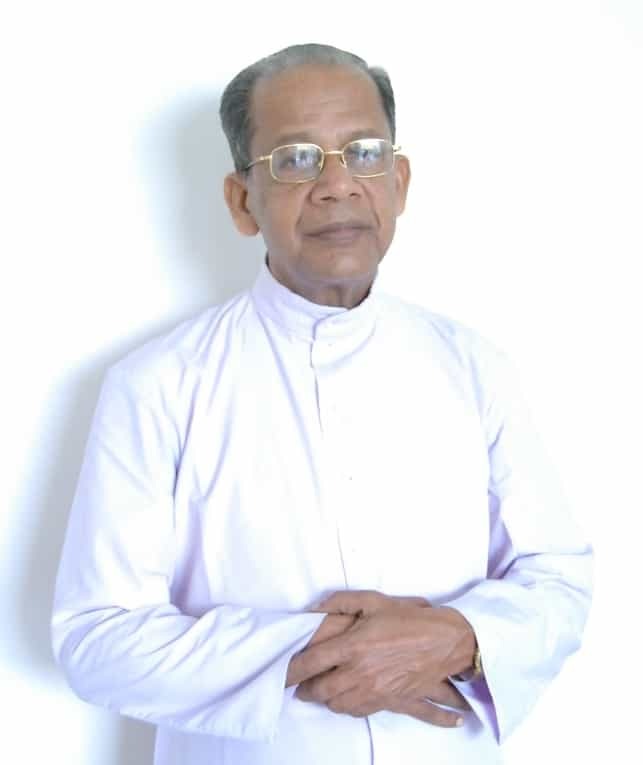 Fr.K.O.Francis is a 76 year old missionary priest, spent nearly 25 years in various north Indian states as a lay missionary-“brother” and 28 years spent as priest in different parts of the subcontinent. His life was full of hardship and misery, illness and poverty.He narrated his life story when he visited me last week. He was born in a middle class family on 22nd July 1934, last of the 10 siblings to his parents, in a village called Nedungapra.Our great grandparents, The Kalampadan (Kalambattu)family were migrant from the south, Arakkuzha and nearby places. From very early days he was very prayerful, highly spiritual and used to serve in the village church as an altar boy. After completing matriculation and 2 year Latin study, he joined the OCD (Order of Discalced Carmelites) as a novitiate in 1954. But ill health did not allow him to complete the novitiate. He used to get very severe pain from stomach ulcer, and vomiting bile. He was taken to the Catherine Booth Hospital, in Nagercoil, Tamil Nadu, which is a Salvation Army Hospital. (It is named after Catherine Booth, the wife of William Booth, the founder of the Salvation Army.). An American surgeon by name Dr Noble operated him under local anesthesia which took 5-6 hrs. But later found the operation was not successful, indeed done wrongly. He went back to his village and recuperated and after one year went back to the OCD in Thakkala to repeat his novitiate again. Unfortunate, after 8 months he became ill again. He was taken to Holy cross mission Hospital at kottyam near Quilon.The German doctors who examined him advised a redo surgery, meaning opening his abdominal wounds again. They gave only fifty percent chance of survival. So he was not keen to undergo the operation. Stayed in the hospital for 2 months and got better by medications. Dr Rogan, the German doctor treated him reassured him that he can get back to an active life, than a contemplative life. Since he was rejected by OCD as he lost two chances of completing novitiate, he felt frustrated. 1958-He took a train to Raipur (MP) to join the Pallotine order (order est. by St Vincent Pallotine).It was early days of Pallotine missionary work in India, there were only 3 members when he joined. Their missionary activityÂ involved not only evangelization but also humanitarian work, especially among the poor and disadvantaged, promoting economic development,Â education, health care and in orphanages. Fr Francis was no stranger to hardship. Yet in the midst of hardship, he heard God\’s call and continued his life\’s call. He lived a life of hunger, disappointment and frustration. A typical day for him combines a dizzy schedule of visiting villagers and the sick, to attend to parishioners\’ needs,preparing people for baptisms, weddings, and funerals. Six months after joining there, he became ill again, went back to Kottyam, the doctors again advised redo surgery, but he was not keen, got treated by medicines, and got better. Went back to Raipur, and continued his mission work for a long period of ten years under late Fr.Hunold. He was involved in mission work in 80 villages, traveling by foot or at time on some one’s bicycle back seat. Living among the poor,the oppressed and the overburdened low caste villagers.1968, Fr. Hunold had an accident and went back to Germany. He always wanted to become a priest but his health prevented it, so what left is to become a ” brother”. This was not what he wanted. He felt empty even though his health had become stable. 1968-He joined the CMI (Carmelites of Mary immaculate) fathers in Raigarh (MP) to continue the mission work. His missionary work involved traveling in rural villages, staying with the poor, teaching them about the good news, and prepare them for baptism- (mass baptism took place those days). He spent another eight years of the missionary work with CMI fathers. Most of villages were very poor and had no electricity and running water, most of the time he commuted on foot miles and miles sometimes thru jungles. 1973-Got typhoid and the stomach illness flared up. Taken to St.Johns Hospital Bangalore, they gave only 10% chance of survival after the operation. He didn\’t get operated. 1974-He goes to Hazaribag in Bihar, meet Sr. Collet a matron in a government hospital, thru her contacts with Sr. Segrid, was then taken to Dr.Sr. Frederic in Holy Family Hospital in Ranchi. There he underwent the second major operation.